Café Baroc. Don't ask me what that painting of George Washington is doing there. 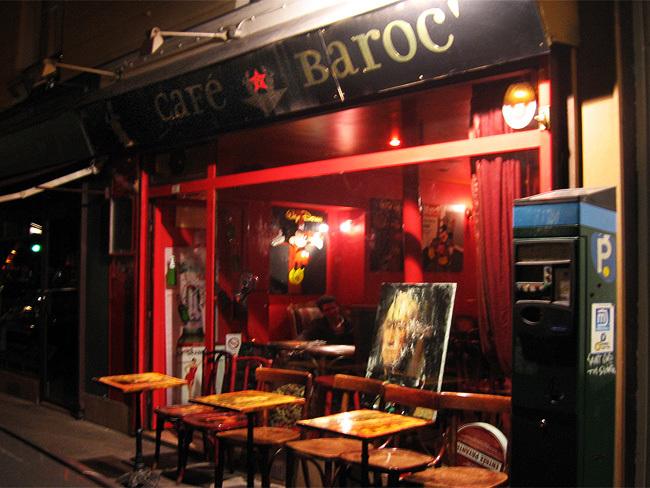 Café Baroc is a cute little bar in the Marais, and honestly the main reason I became familiar with it is because it's often where my friends and I go when the Politburo right down the street is overcrowded or mysteriously closed, both of which seem to happen a lot. (Update: The Politburo is now gone all together! Shucks!) Anyway, Baroc has a great, friendly, laid back ambiance, and I like the cute and quirky decor: warm colors, soft lighting, strange old fold-down movie theater seats, weird vintage artwork on the walls and laminated onto the tables (neat! ), etc; it's a bit of quaint old artsy Paris mixed with modern gay hipster Paris. The barman often brings us a little dish of gummi candies for some reason, which I think is a great touch! The bar, and indeed the whole neighborhood of the Marais, is very gay-friendly. And unlike the Politburo, you can get a decent glass of wine here, which is a big plus for me!